View Larger MapThe City of Chicago has plans to install a cycle track on Kinzie between Milwaukee Avenue and Wells Street. A "Cycle Track" is essentially a dedicated bike lane that is separated from the main roadway and motor vehicles by a curb, a sidewalk, planter boxes or other kinds of physical dividers. The purpose of a "Cycle Track" is to allow bicycles to safely travel and to allow for all kinds of traffic to travel more fluidly. This stretch on Kinzie between Milwaukee and Wells is mostly north of the Chicago River and will create a conduit between Milwaukee Avenue and the Loop. Milwaukee Avenue has a dedicated bike lane that sees considerable bicycle traffic on a daily basis. This cycle track will allow for the bicycle traffic off of Milwaukee to flow towards Wells Street which, in turn, goes into the Loop. Interestingly, this cycle track is being built with federal funds that were originally granted to the Chicago Department of Transportation to build a cycle track on South Stony Island. Apparently, the change in location was made because of concerns that the cycle track on the South Side would not see enough bicycle traffic to justify the funds used. I previously put a post on the Stony Island bike lane on www.IllinoisBicycleLaw.com that you can find by clicking here. 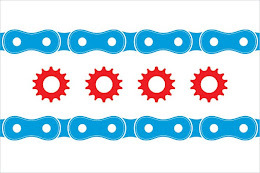 However, regardless of the location of the cycle track, I am very pleased to see the City of Chicago once again being progressive in encouraging bicycle use and developing the infrastructure to make bicycle commuting more conducive. I am also encourage that these kinds of protected bike lanes will make bicycling safer in Chicago. As I've written about extensively on this blog, the number of incidents of "doorings" in Chicago have reached almost epidemic numbers as the number of bicyclists increase in the congested Loop and nearby neighborhoods.